Amazon Kindle Voyage Review: Is It Worth The Price? The Amazon Kindle Voyage is quite a great thing that has happened to Amazon since it introduced its latest E-reader known as Amazon Kindle Voyage. Amazon Kindle Voyage rather than focusing on value alone, it focuses on creating for their massive readers a high-quality device with a crisper screen and impressive features such as squeezable touch buttons. The whole story about Amazon’s Kindle began in 2007. Going by information on some popular sites like cnn.com, Kindle is allegedly said to have helped in selling more than a quarter million units of Amazon books. Although this doesn’t represent the actual sales figure, but it’s an indisputable fact that Kindle is really selling on a very high demand since its invention in November 2007. One major reason for this success isn’t nothing but because of its marketing effort. The good news is, you don’t need to spend to the roof to get your own reading device. Today Kindle Voyage comes handy and you can get it now for $179.99 as against its list price of $199.99. Although not everyone may consider this the best price especially if one is on a budget, but the value is quite worth the investment. The question you undoubtedly have in your mind is: Is It really worth the price as I claimed? I will advise you read on to unlock the answer to this question…Or Do you think you really need a $199 E-reader (though with the ads that pop up on its screen from time to time)? In a very simple answer, I would say yes. What Is The Amazon Kindle Voyage? Amazon Kindle Voyage is the latest and high-quality E-reader created by AMAZON to serve as an extender for the family of Amazon devices and to further help boost the experience people had with its Kindle Paperwhite. It’s a high-quality and very exciting E-reader device created by Amazon with a very broad glass-screened marvel that can accommodate more of Kindle books within its borders and allows you have that fantastic reading experience in better way to that you have had with Paperwhite a few years back. The cheapest price of the Kindle Voyage starts at $179 (Wi-Fi only, with special offers). The complete package (WiFi + 3G, no built-in ads) costs $269. That’s a lot for a simple ebook reader device! So, Why Amazon Kindle Voyage Is So Special? I know for sure if you had tried The Kindle Paperwhite before some years ago you would also want to try Kindle Voyage which is more or less like a latest edition to the Paperwhite. I bet you don’t want your device to remain stagnant with little or no regular updates and potentials. Unlike The Kindle Paperwhite, the Kindle Voyage is such an extremely handy, ultimate E-reader device designed to fully correct all the shortcomings and downsides of the Paperwhite. This means you get a device that will be getting regular updates and without its potential being maxed out. Amazon didn’t just update the Paperwhite for the single reason of improving their previous E-reader devices, but the company came up with the creation of an entirely different product: the Kindle Voyage. It has high-resolution of 300 PPI display. This enables you to read even more like the printed page. There is the PagePress feature. What this does is to give streamline turning the pages without lifting a finger when reading. Adaptive front light making your device to provides ideal brightness that fit all times of the day whether day or night. Battery life: The unlimited battery life enables you to use your device without having to bother about plugging it to light. The battery life is another awesome thing about the device. I tried testing it on several occasions. If you’re a kind of a person who likes e-reader like me you probably would have tested many E-reader batteries, and may be one or two you did test would have got you disappointed with what you got after that. I like listening to my 3G radios a lot while reading on my Kindle Voyage and at the same time turning on my Wi-Fi. I read different books on it for almost a week and surprisingly when I would check after all these cruel using I subjected the device to; I still found my battery more than one-thirds full. Although the Kindle Voyage is clearly distinguishable from other E-readers but there is the possibility that you might mistake this for a Paperwhite. I am going to help you get some technical details that will help you sift through the various E-readers out there so you don’t end up buying what only looks like Voyage but only for you to find out later it isn’t. It’s true that the Voyage is 7.6mm thick in size and weighs 180g as against the Paperwhite which is 9.1mm but that still isn’t enough for you to differentiate the two. Going on this comparison, I must state here that most E-readers and Paperwhite of the recent years have almost identical looking; with all looking hand-sized frame, round and flat in shape. However, there is a slight difference in how they feel when you hold them. For example, one noticeable difference between the Kindle Voyage and the Paperwhite Kindle is that you can comfortably hold the former in one hand for longer than you can the latter. Although this doesn’t mean the Paperwhite is heavier as they’re both lightweight and well-balanced when held except for the little difference you will notice in the two. Everyone doesn’t actually appreciate the value of update on any device and the hate in what they us3e to have previously until they’re opportune to have the change from that to a completely different thing. That was exactly how I felt when I first got the Voyage Kindle. Having the power button (now-circular power button) changed from the usual place (it used to be in all other previous Kindles) and moved to the rear, at exactly the point where your index finger naturally lies is quite a great improvement to the Kindle Voyage. With this development, I now realize the benefit of not having to contort my thumb all because I want to turn on or off my E-reader. Another excellent development is in the size of the display. 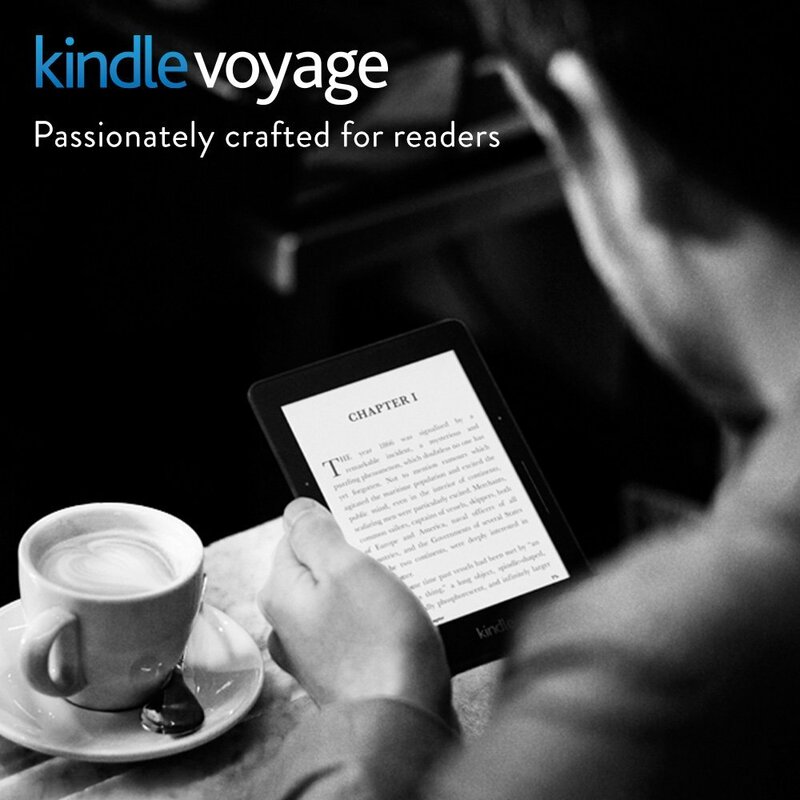 With the latest technology used in crafting the Kindle Voyage, you have Amazon’s 6″ display technology with adaptive front light that adjusts automatically, plus 300 ppi and optimized font technology, everything has indeed changed for the better and you can now have fantastic reading experience. As against the Paperwhite and other Kindles that feature an inset plastic display, the Kindle Voyage is excellent with edge-to-edge glass, no hard plastic bezel involved and without any physical page turn buttons yet retreating in a book is as seamless as just simply squeezing the device’s edge. Your device has two indicators which are known to Amazon as PagePress. They’re for turning a page backward or forward. For example, when you squeeze the long one a page is turned forward, while the short one is for going backward. To move around the whole of the Voyage’s numerous menus, all you need to do is to tap on the display itself and you’re good to start navigating all the nooks and crannies of the device. Reading can be difficult and boring at times if you’re reading from a distance or in a dark. You may not appreciate the difference between using the Kindle Voyage and the Paperwhite here until you find yourself in any of the situations above or you find yourself reading to the smallest font settings. This is where you will enjoy the Voyage’s adaptive front light. Amazon’s use of the state of the art technology that helped them crafted this amazing device that makes your reading resembles reading on real paper and well-researched and hand-tuned optimal brightness setting that’s fitting for every lighting condition. The adaptive front light automatically adjusts the brightness of the display to your immediate environment, and this doesn’t stop you from also taking the control by adjusting further to your personal brightness preferences. Display: Incorporated with Amazon’s 6″ display technology and adaptive front light that adjusts automatically and fit all environments, be it day or night. Battery Life: Once fully charged the battery can last for as long as up to six weeks, based on a usage of half hour of reading per day with wireless off and the light setting at 10. The Battery life is to a very large extent dependent on light setting and wireless usage. Charge Time: It reaches maximum charging once it has been charged for approximately 3 hours from a computer via USB cable. Wi-Fi Connectivity: It supports connectivity to public and private Wi-Fi networks or hotspots that use the 802.11b, 802.11g, or 802.11n standard with support for WEP, WPA and WPA2 security using password authentication or Wi-Fi Protected Setup (WPS). What Is included in the Box: Kindle Voyage, Quick Start Guide and, USB 2.0 charging cable. PagePress buttons that allow you turning the pages without lifting a finger when reading. This is an awesome experience! Relatively thinner and lighter and makes it comfortable for you to hold in hand for a little longer. Free access is given to Prime members to read more than a thousand titles and books via the device. Although you might not find this exciting if you’re not in that status. Unlimited and Free trial period of Kindle Unlimited for 30 days. No restriction as to the titles you can choose from. There are over 1 million titles for you to explore. Includes ads which are already added to the Base price of the device. What Are Buyers Saying About It? As of the time of writing this review, there was a high and positive rating of about 65% found on Amazon.com page of the Kindle Voyage. Some of the reviews found are as follows. Although there were other negative ones which space may not allow me to include here but you check them all Amazon.com yourself. “Definitely the best e-reader I have ever owned. Super sharp display and very convenient to check what books are on sale and easily purchase while on the go”. “My beloved Paperwhite was nearly five years old and I decided to purchase a replacement before it died. I went with the Voyager because of its light weight and pressure-sensitive page turn controls. I am very happy with the Voyager and would recommend it to anyone who is thinking about replacing a Paperwhite”. However, the buyer below found it not interesting though the reason he gave can’t be taken as a sufficient ground for discrediting the awesomeness of the product as there were far more positive reviews than negative ones. “I would have given it 5 stars except for the voyage (and the paperwhite) both lack the ability to change the background to black and the script white. The original kindle did that and I still miss the feature as it is easier for me to read at night”. Kindle Fire – a replacement for eInk Kindles?